Leon’s home church is Eglise Chretienne des Menelas (Menelas Community Christian Church). He was ordained into the ministry in 1975 at the Red Quarry Christian Church in French-Lick, Indiana. Leon graduated from Cincinnati Christian Seminary in 1987 and started his ministry in Cite Soleil in 1988. 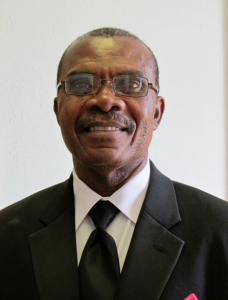 Haiti Outreach Ministries began in 1990 with Leon as the founding director. Over the last 25 years, Leon has led HOM on the ground in Haiti, leading efforts to build churches, schools and clinics as well as developing the leaders in Haiti needed to sustain the ministry. He also has been the primary spokesperson for HOM, speaking at churches and raising funds to support the ministry throughout the United States and Canada. In the aftermath of the 2010 earthquake, he enlisted the help of key leaders in Haiti to help manage the needs of the ministry. Together the MICECC and HOM board of directors oversee the work of the churches, schools, clinics and other programs in Haiti. In 2015 Leon stepped down as President of MICECC but continues to be an active supporter. Although he will continue to travel and speak to groups on behalf of the ministry, he hopes to focus on being a mentor and teacher to Bible College students as wells as church leaders in Haiti. He is married to Jacky who is the superintendent of all of the primary schools with an enrollment of more than 1300 students and of the new secondary school in Baryé Fé, opened in Sept. 2015.